Only 5 ingredients in this deliciously, unbelievably light fresh strawberry cake with a layer of strawberries baked right in. Add a dollop of whipped cream for a perfect summer dessert. 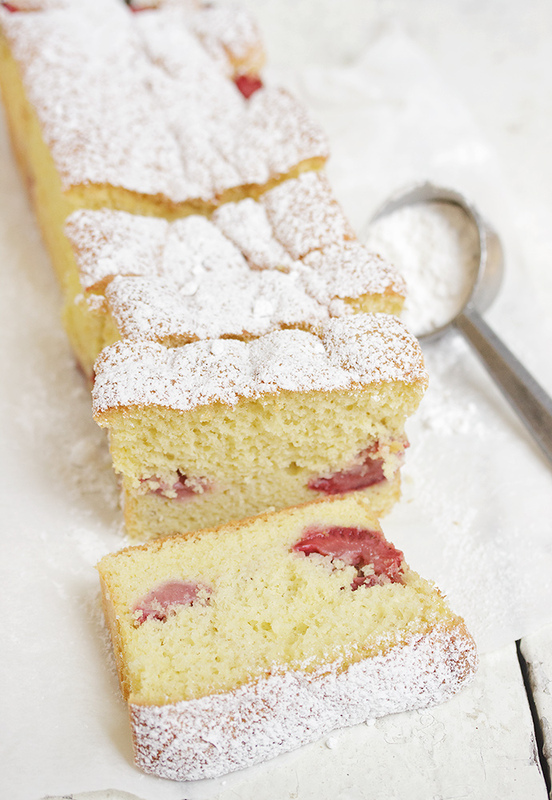 If you’ve ever enjoyed strawberry shortcake made with sponge cakes, you can easily imagine what this loaf tastes like. The sponge cake is unbelievably light, made from only eggs, sugar and a bit of flour (no additional fats). The strawberries are simply cut and scattered over the top of the batter before baking and while the loaf bakes, they sink to the bottom to make a fruity layer. Pop it out of the pan, dust with powdered sugar and serve a slice with a dollop of whipped cream for a perfect summer desert. If you’ve never made a sponge cake, it’s a bit of a different process. It’s definitely easier with a stand mixer, but a hand mixer will work fine as well. The trick is to be sure you whip it 9-10 minutes, until it’s light in colour and tripled in volume. Then, sift the flour over top and fold in gently to be sure not to lose too much of that air you just whipped in. Finally, don’t open the oven for the first 25 minutes of baking, to make sure you don’t lose your loft. I love to bake this as a loaf. It’s so easy to pop out and slice. Lining the loaf pan with a sheet of parchment that overhangs the sides, makes it a pain-free process. Obviously, as I always seem to say, this would be good with any summer fruit – blueberries, blackberries, raspberries, peaches. 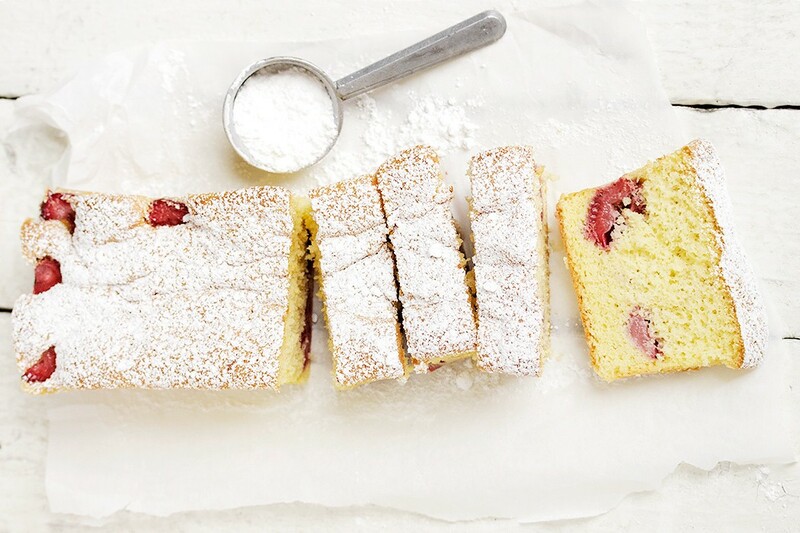 A delicious, light sponge cake with strawberries baked right in. Baked as a loaf, this loaf is a perfect summer dessert served as a slice with a dollop of whipped cream. Preheat oven to 355° F. Lightly grease a loaf pan (I used a 4x10-inch, so a 9x5-inch should work just fine) and line with a sheet of parchment paper that covers the long sides and overhangs the sides by a couple of inches. Set aside. In a large bowl or the bowl of a stand mixer fitted with a whisk attachment, beat the eggs on low speed until foamy. Increase speed of mixer one notch and slowly add the sugar, until it is all added. Increase speed of mixer to high and whisk until mixture is light and tripled in volume - 8-10 minutes (don't skimp on the mixing time part!). Add vanilla in last minute of mixing. Remove bowl from mixer (if using). Using a sifter or fine strainer, sift the flour over the top of the batter and gently fold in to the batter until it is just incorporated. Pour batter in to prepared pan. Sprinkle prepared strawberries evenly over the top. Place in pre-heated oven (*you can place loaf pan on a baking sheet if you like) and bake until top is deep golden and a tester comes out clean - about 30-35 minutes. (*avoid opening the oven door for the first 25 minutes or so of baking). Allow to cool in pan for 15 minutes, then run a knife along short ends and gently lift the loaf from the pan using the parchment overhang. Allow to cool completely. 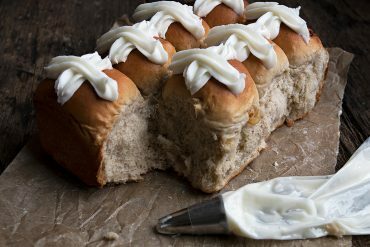 To serve, dust loaf with powdered sugar and serve in slices with a dollop of whipped cream. Seems like such a delicate dessert, like something I’d make to my mom on Mother’s Day. Great recipe! Thanks Sean and yes, it’s a perfect special occasion treat! I love, love, love the simplicity of this cake. Plus, I’ve been looking for the perfect strawberry dessert to make for the launch of summer. Yum! Hi there was wondering how this recipe is for freezing? Hi Sarah. I have not tried freezing it. 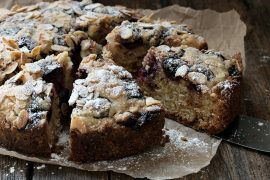 On the one hand, I’ve always had good luck freezing baked goods, but this one is quite a unique texture with moist strawberries, so I’m not sure exactly how well it would stand up to the thawing process. So pretty, and so simple too!? Sounds amazing, Jennifer! How do you keep the strawberries from sinking to the bottom of the cake? Well, it’s tough :) Make sure batter is well whipped so it’s as thick as possible. You could try cutting your strawberries a bit smaller, as well, so they’re not as heavy. This is baking as I type! Wonderfully easy to put together – forgot to pick up strawberries, so I’m trying it with thawed (!) frozen cherries instead. 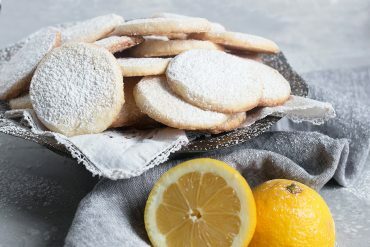 Just one thing… I am VERY new to baking, and follow recipes to the letter (other than cherries & strawberries, of course!) so I had a bit of an Oops! moment as I straightened up from putting it in the oven, only to see the untouched bottle of vanilla staring at me! Double checked your recipe, and nowhere does it mention when to add it in. The remains of the batter didn’t seem any the worse off for its omission! Sorry about that, Penny. Forgot to include the vanilla in my instructions. Fixing now and thanks for the heads up on that :) Enjoy the cake! Five ingredients? Too easy. I’m coming over for tea and cake! 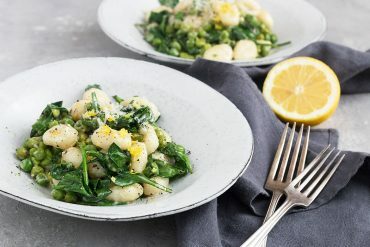 This looks so light and summery I can only imagine how great it tastes! I was interested to read your description of sponge cake because I also have not made one. 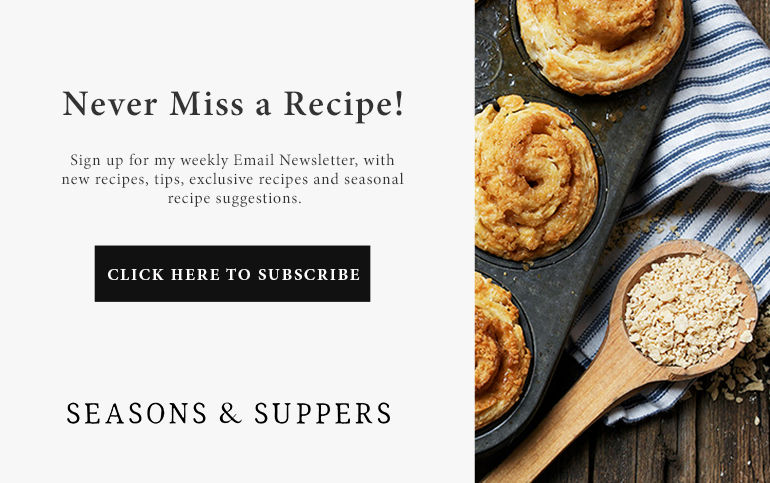 I remember a few years ago a blogger friend from the UK published a recipe that really intrigued me: it was all in portions, not measurements. I always thought I’d like to try making it. Your beautiful cake has me feeling that even more! Thanks Toni. 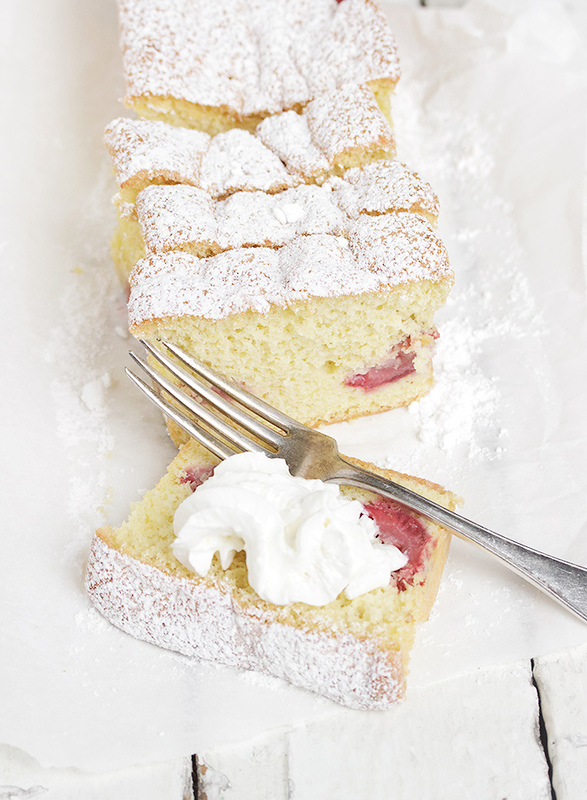 I think of sponge cake as just like an angel food cake, except made with whole eggs. The process is exactly the same and it has the same light texture and delicious “crust”. This is such a gorgeous loaf. 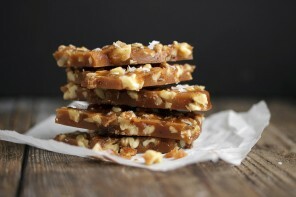 I love that there is only 5 ingredients…and no oil or butter. I can eat several slices of it right now. Thanks Michelle, but I sure hope you’re whipping the whole eggs and not just the whites! My mind has been thinking non-stop about strawberry shortcake. I think it’s all the wonderful strawberries in season. 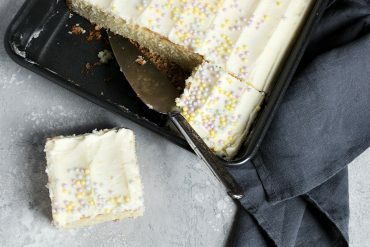 This shortcake loaf is nothing short of amazing – simple, beautiful and from the looks of it quite tasty! Thanks Jessica. Hard to resist the strawberries here right now. The local strawberries are in season and they are always the best! 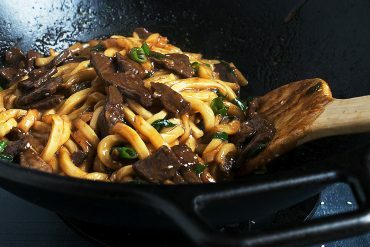 Love how few ingredients there are in this! Easy and perfect for a picnic! Thanks Katrina. It kept really well too! 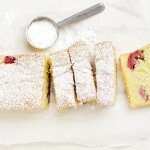 Jennifer, by just looking at your photos I can tell this shortcake loaf is light and fluffy! I think you’re right and this will be a popular recipe for any type of summer fruit! Delish! This looks amazing Jennifer and light as a feather. We’re done with strawberry season here but I can think of all kinds of other fruits that would be wonderful! Thanks Chris. I think it would be awesome with peaches! Thanks Sue. It was a breeze to make, too! I agree with Tricia that this dessert is just gorgeous and simple perfection. I just want to dive right in. You really have that special touch. Dessert genius! 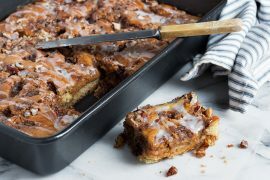 I’m always tempted to make extravagant desserts with sixteen layers of fudginess and caramel drizzles, but at the end of the day, it’s gorgeous desserts like this that are the most delicious. Simple perfection – and it is so beautiful too! Love, love, love your photos.